Physics is hard, especially if math isn’t your strong suit. The concepts that physicists deal with every day are mind-boggling and it can be especially difficult to explain them, even in a very rudimentary way, to non-scientists. 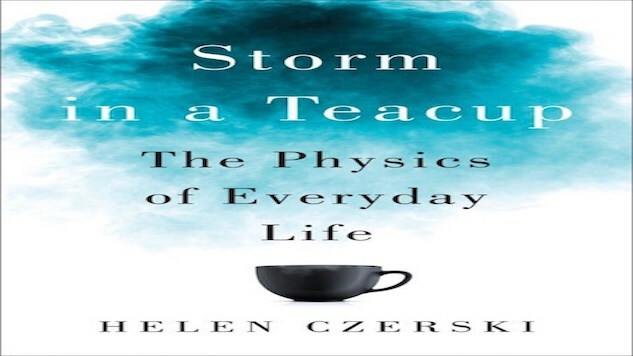 Helen Czerski is a physicist whose goal is to help you understand the physics of the world around you. The stains your coffee leaves on your desk are connected to the larger and wider issues we face, such as climate change—but how? Czerski makes those connections for us and shows us the physics of everyday life. You’ve heard of quantum physics, but quantum gravity?? It’s a branch of theoretical physics that is trying to explain the force of gravity through quantum mechanics. Right now, gravity as we know it is explained through classical physics and Einstein’s theory of relativity. Rovelli is a physicist working towards an entirely new understanding of and explanation for gravity, which will help us reconcile relativity and classical physics with quantum mechanics. It sounds complicated (and it is) but this book is aimed at laypeople, and seeks to put the quantum gravity in its historical context. Time is relative. We know this, and yet as non-scientists, do we really understand what it means? That’s what Alan Burdick, a science writer, tackles in his investigation of time. This is a social and personal history of time, rather than a purely scientific approach. He uses journalism as much as science to explain the mechanics of time to us, how it works, and to explore the role it plays in all our lives. Have you ever wondered what real space travel will actually take? What it will take to establish a colony on another world, or a space station that isn’t in low Earth orbit? Neil Comics, a physics and astronomy professor, tackles that question in this gorgeously photographed book (coffee table book fans, take note.) What do we have to do in order to make space tourism feasible? A lot of us have personal investment in the answer to that question, and Comins lays it out beautifully. The 2017 eclipse is coming and it’s making headlines everywhere (if you haven’t made your eclipse plans yet and want to see it, you’d better get on that right away). It’s not surprising that there are a few books on eclipses releasing early this year, but this book that combines science and history seems like a sure bet. Dr. Carrie Nugent is a scientist and TED Fellow who focuses on asteroids, and in this book (which was Nugent’s TED talk), she discusses the basics of asteroids. What are they? Where do they come from? Are they ever going to hit us? Bonus: It’s only 120 pages, which makes this a short and succinct guide to what we know (and what we don’t) about asteroids. Exoplanets—planets that lie outside our solar system—are going to be huge over the next few years. But what do we know about them? How are we finding them? This overview by two astronomers discusses not only awesome planets we’ve discovered (a planet made of diamonds! rogue planets wandering through empty space that are not part of any system! ), but what they mean for us and for what else is out there. This is a book about history just as much as it’s a book about science. How did our universe begin from nothing? What does that mean about the nature of our reality? In this highly anticipated book, Krauss takes readers back to the beginning, to the birth of the universe, and tells the stories of the scientists who helped uncover our origins. Krauss’s aim with this book is to do nothing less than redefine and reevaluate the universe and our place in it. Physics is all about fundamental ideas; if you understand the building blocks, you can more fully understand the complex theories that define the cosmos and the world around us. And if you understand how we arrived at those building blocks and theories, you can more quickly grasp their implications and why things are the way they are. In Universal Brian Cox and Jeff Forshaw try to explain those basics to laypeople, but also to help us understand how we arrived at those conclusions. What measurements led Edwin Hubble to determine that our universe was expanding? How do we measure the distance between Earth and the other planets in the solar system? This book well help you do this on your own, and therefore help you further understand the universe. Our minds cannot truly grasp the concept of infinity, but Eugenia Chang takes us on a wild journey to help us in our search for it. It’s a small, unassuming symbol—8—but it holds a giant idea. Cheng helps us understand the basics of infinity and then takes us on a ride to see its most lofty applications. From the practical to the entirely theoretical, this is a book to watch for. This year, our clean slate, 2017, is already shaping up to be a great year for books. Just in the months January, February, and March, there are a plethora of mind-blowing science book releases. If you’re interested in space, time, or the physics that govern our reality and how we perceive the universe, you should take a look at these excellent books.